Country of Origin: Bismarck Arch. 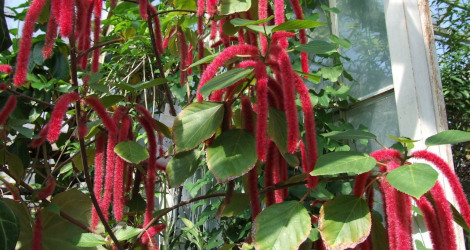 Description: Showy tropical shrub with broad ovate, bright green, hairy leaves with crenate margins' bright red flowers in long, pendant spikes resembling foxtails. Tropical climate. In indonesia, a root and flower decoction is used for hemoptysis. Leaf poultice used for leprosy. In Malaya, decoction of leaves and flowers taken internally as laxative and diuretic for gonorrhea. Bark used as expectorant and for asthma. In Africa, bark root used for pulmonary problems; leaf for leprosy, and flower for kidney ailments and as diuretic. Antimicrobial: Studies of leaf extracts isolated gallic aicd, corilagin and geranin responsible for antimicrobial activity. Trypanocidal: Aequous extract of Acalypha hispida leaves suggest trypanocidal effect. 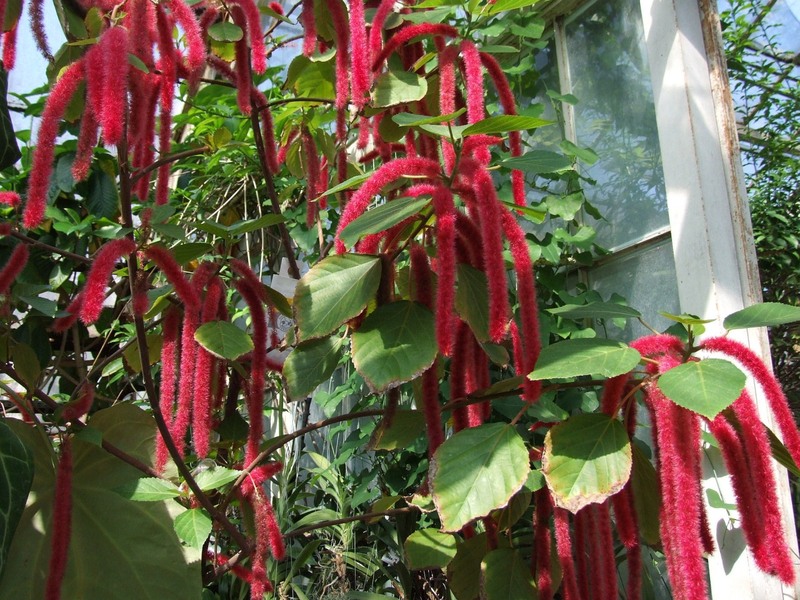 Anti-ulcer / Anti-tumor: Studies yielded geraniin and dehydroellagitannins which suggest diverse biological properties including anti-ulcer and anti-tumor effects, antibacterial activity against helicobacter pylori and antifungal activity. Phytochemicals: Phytochemical studies yield phenolics, flavonoids, hydroxyanthraquinones and saponins. It also detected steroids , phlobatannins and glycosides. 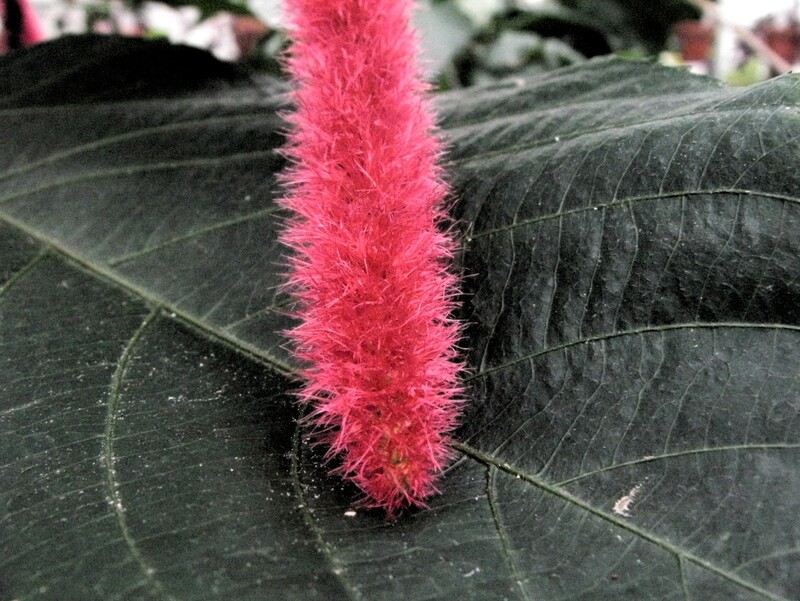 Anthocyanins: Study isolated three anthocyanins from the red flowers of the chenille plant. 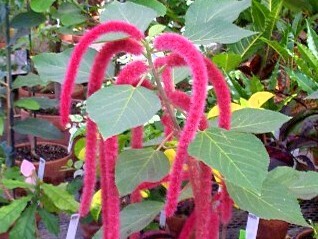 Chenille Plant at Philippine Alternative Medicine. Last accessed Wednesday, 12 December, 2018. Image #00 (cropped) & #03 (original) by Jerzy Opiola [GFDL or CC BY 3.0], from Wikimedia Commons. Last accessed Wednesday, 12 December, 2018.